Russia’s Elections. Who is Calling the Shots at the Duma? The Russian elections this month held some unwelcome surprises for the nation’s ruling party, “United Russia”. Administered in tandem by current president Dmitri Medvedev and prime minister Vladimir Putin (soon to be president once again), United Russia found itself receiving significantly lower-than-normal parliamentary results. This, combined with the protests that ensued quickly thereafter, seems to have sparked the corporate media’s hopes for a “colour revolution”. The situation echoes the Serbian, Georgian and Ukrainian models; in these and several other countries, the governments had to step down after mass protests were organised with the support of US think tanks including the National Endowment for Democracy. These actions, led by the US and several EU countries, were geared toward the installation of leaderships that were more in line with Western agendas than their predecessors, and not necessarily in the interest of the Russian population. Certainly no effort is being spared to work towards a change of government in Russia. However, these suggestions of a “colour revolution” do not correspond to Russian realities at all. American and West European media love to project their perceptions of a pro-Western civil society onto the protesters in Russia. Without a doubt, the archetype of the young academic activist who blames the government for being “undemocratic” and who advertises his West-friendly ideas on his internet blog certainly does exist in Russia. And the way the various neoliberal-oriented groups are being financed by the usual suspects is well documented. But even in Western media one can read between the lines and notice that the majority of those expressing their dissatisfaction do not fit this scheme. It is doubtful that these ideas by the undisputedly strongest Russian opposition party would please the missionaries of “democracy” of the so-called international community. Consider the following: 1996 saw the second presidential election since the end of the Soviet Union in 1991. The Western favourite at the time was Boris Yeltsin, who was then the sitting president. His skewed interpretation of “democracy”, however, resulted inter alia in the storming of the Russian parliament in 1993, followed by the creation of a constitution legitimising presidential absolute rule. In addition, Yeltsin was a puppet of the so-called Oligarchs, people who managed to become incredibly rich using lawless methods during the chaotic period of transition. In treating the country as their personal property, they caused the disintegration of the state and extreme impoverishment of the majority of the population. In the 1996 election Yeltsin’s challenger was the same Gennady Zyuganov now leading the Communist Party, who was the projected favourite on account of to the president’s countless corruption scandals and unprecedented redistribution of wealth from the bottom sectors of society to the top. Interestingly, NATO did not reward Yeltsin’s servility and instead expanded along Russia’s borders by pulling former Soviet republics into the NATO alliance. Yeltsin stepped down at the end of 1999 and named Vladimir Putin as his successor. Choosing not to be a puppet of the oligarchy, Putin turned against his former supporter, Boris Berezovsky, a billionaire who made his fortune thanks to privatisations of state property, and who used to be deeply involved in politics during the Yeltsin era. Berezovsky was later convicted of financial crimes after having already received “political asylum” in Britain. A noticeable stabilisation of the Russian state was achieved during the years of Putin’s presidency, and these improvements caused the communists to lose many voters to the government party. Part of this process also included an informal agreement with the oligarchs in order to let them keep their largely illegitimately gained fortunes on the strict condition that they stop intervening in politics. This explains the harsh way the Russian state is handling the case against former oligarch Mikhail Khodorkovsky, who did not respect this deal and tried to organise resistance against Putin’s government. Khodorkovsky will likely spend many years in prison on account of this; in the West, however, he is practically being presented as a glorified dissident by the mainstream media. Next to many successes, several problems remain. Russia’s prosperity is heavily dependent upon the prices of raw materials, which the country exports. A considerable stagnation cannot be denied, and many people complain about high living expenses. This may well be a large reason for the relative loss of confidence in the government from various sectors of the population. 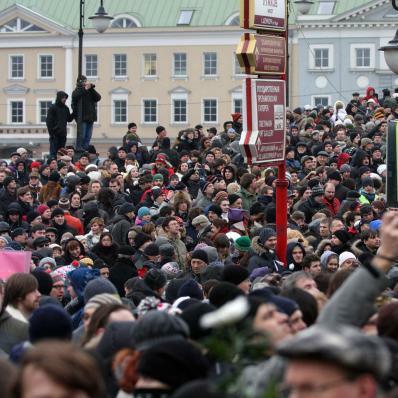 Next to politicians who are striving for better social conditions and those who are engaged in Western-funded organisations, Russia’s far right movements are also participating in the protests. Vladimir Zhirinovsky, the reputed clown of the political spectrum, is one case in point. With his nationalist Liberal Democrats, he enjoys drawing attention to himself by creating sensationalist scandals. On the other hand he regularly votes on the government’s side in the Duma and therefore can be seen as relatively harmless and controllable. In essence Zhirinovsky has no real influence on the ultra-chauvinist movements, who stir up hatred against populations from Central Asia and North Caucasus, and other minorities. Taking all this into account, the prospect of a unified protest movement – consisting of people going into the streets for improved social conditions, adherents of neoliberalism, and extreme chauvinists – does not appear to be a realistic option. It is to be hoped that Vladimir Putin, soon returning for another round as president, will be responsive to the people’s wishes for better quality of life. And in the West, those who truly want the Russian people to live in peace and prosperity need turn away from the propaganda spread by self-proclaimed “democracy” exporters and understand what is happening on the ground.